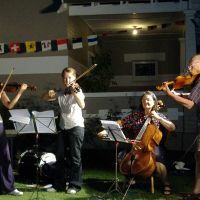 Additional Info: Since retiring in 1999, I have taken pupils in violin or beginner piano, usually starters, mostly primary-age but some secondary/University, with a timetable of about 8/week. With these folk, I organise Kids' Concerts each year for our Street Party, 15 so far. Fees: I seem to taking mostly kids from single-parent/aboriginal families, for whom I do it for free, with joy. Uni students & other rich people(!) pay $10/hour.